Ted goes on to be a noted violinist, and Olivia finds success as an actor. When the unexpected appearance of a legendary violin brings them together years later, they rediscover the connection that never died. I never went to boarding school myself, but my father taught at one in California and was later headmaster of another in Texas. I was in high school myself at the time, and hanging around my dad’s schools gave me a good idea of what life was like for boarders in the late 1960s. Haviland, the school I invented for my characters in Strings, is a blend of those schools and several others I got to know as a student and later as a teacher. The Haviland campus has some features reminiscent of the Webb Schools in Claremont, California. The auditorium is drawn from memories of my own alma mater, Polytechnic School in Pasadena. I based the students and teachers on people I met over the years at all these various institutions. The violin — the “Merino Rose” — is the result of an afternoon visit to the studio of a violin maker in Pleasantville, New York. He showed me his instruments and spoke about fabulous old violins that have sometimes gone missing for decades. As I created my fictional violin and developed its story, I also sought the help and advice of other violin experts, violinists, and musicians. Inspiration for the love story came in part from two books, Love Story by Erich Segal and The Bridges of Madison County by Robert James Waller. It occurred to me a while back that these two short novels are the first two volumes of a trilogy that doesn’t exist. Love Story is the story of young love cut short by death. Bridges is the tale of a wife and mother who chooses the happiness of her family over her own. I’m still waiting for the third installment — in which a mature woman finds true love. Can things work out for her at last? (Here’s an article I wrote that explores this idea in more detail.) 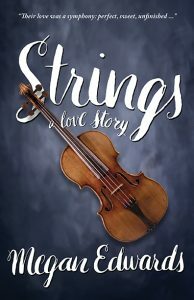 While Strings is not a part of this imaginary trilogy, Love Story and Bridges of Madison County gave me the idea of telling my tale in three parts. 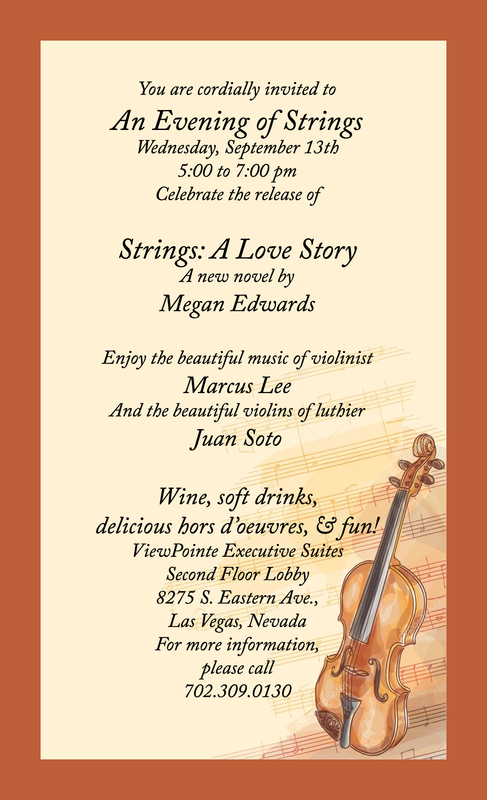 If you’re in Las Vegas on Wednesday, September 13th, you’re most cordially invited to the launch party for Strings at ViewPointe Executive Suites, 8275 S. Eastern Ave., Second Floor Lobby, from 5:00 to 7:30 pm. Enjoy the beautiful music of violinist Marcus Lee and the beautiful violins of luthier Juan Soto. Hors d’oeuvres, wine, and soft drinks, too! More details (and a map!) are online here.